The disqualifying medical conditions are listed below. The International Classification of Disease (ICD) codes are listed in parentheses following each standard. a. Audiometers, calibrated to standards of the International Standards Organization (ISO 1964) or the American National Standards Institute (ANSI 1996), will be used to test the hearing of all applicants. b. 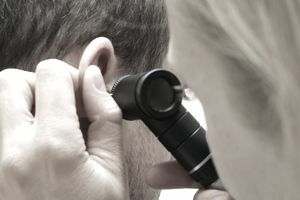 All audiometric tracings or audiometric readings recorded on reports of medical examination or other medical records will be clearly identified. (1) Pure tone at 500, 1000, and 2000 cycles per second of not more than 30 decibels (dB) on the average (each ear), with no individual level greater than 35dB at these frequencies. (2) Pure tone level not more than 45 dB at 3000 cycles per second each ear, and 55 dB at 4000 cycles per second each ear.